We have two cars. One is the primary car, and the one at home with me during the week, but used by all on weekends. The other is my husband's car, driven 1.5 miles to and from the bus stop for the commuter bus to downtown Seattle, 5 days per week. We've been budgeting $10 every two weeks, for my husband's car for gasoline, which is not quite 3 gallons with today's gas prices. We fill the primary car with gas every other week. We use a gas station which has the least expensive gas, within close range of our house, 3.1 miles away. My husband doesn't have the option of just stopping in at a gas station on his way to/from the bus stop. He had been going out on weekends to get gas. But now, instead of him making a separate trip out to the gas station that we frequent, I bring gas cans in the car's trunk with me, when I buy gas for the primary car, and fill the cans in the same transaction as refueling the primary car. We have 2 gas cans, totaling 3 gallons in capacity. My husband pours the "gas can" gas into his tank when he has time. This eliminates the need for my husband to drive out and back to get gas. Gas is averaging $3.67/gallon with store loyalty card. My husband's car gets 17 miles per gallon, according to an online calculator for his make/model/year. The end result is that we've been able reduce the budget for hubby's gas, as my husband is no longer spending gas to go buy gas. Original electricity savings of $35/mo, plus natural gas savings of $10/mo, plus new use of toaster oven saving $1/mo, plus gas savings using gas cans for hubby's gas of $2.95/mo, totals a savings of $48.95/month. There's an added bonus to buying my husband's gas this way. Every couple of months, I have a 10 to 30 cent per gallon reward on my store loyalty card. By paying for both car's gas in the same transaction, both cars get to use that reward, saving us an additional 30 to 90 cents on his fill-up, in addition to mine. By the way, you can use that formula above, to figure how much it costs to drive to gas stations, that are not along your regular route, or figure any of your driving costs. Use Google Maps for the mileage between two points. The mileage comes up on the same page as the directions. A creative solution, Lili. Is it possible for your husband to walk to the bus stop? It's only 1 1/2 miles away, says the girl who walked 5 miles to Junior high for 2 years. On a nice day (check the forecast in the AM), it's quiet time with your own thoughts.Many walk to the train in this county. I used to walk everywhere, when I was single and living in the city. I enjoyed the time to think. 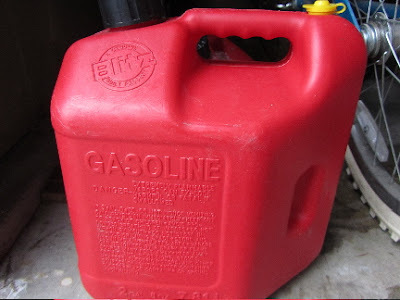 We are a one car family, but my husband has filled gas cans with him like that when he is out so that he doesn't have to make another trip to get gas for the lawn mower, and he sometimes uses it to put some gas in the van for himself if he need gas but won't be going that direction. He found a cheaper gas station nearby that is averaging .20 cheaper per gallon than the one he was going to before. If he goes a different route to work, he can pass this less expensive station on his way (or on his way home), and it isn't any further to drive, either. We combine errands whenever possible and I generally shop less often to keep the gas down. He also purchased a scooter that gets around 50 mph (it only holds one gallon at a time, so having the gas can to fill the scooter is really important!) It should be cooling down enough for him to start using the scooter again soon. That saves us about $5 a day when he uses it to go to work and back. Our last vehicle said it got 17 mph, but the car itself had a meter on it, and in reality we got 11mph, so you may want to check and see if you are really getting what the manufacturer says, or less. I know we were disappointed to get so much less in reality. These little things like you mentioned above have really added up and have helped us to keep going even with our 75% cut in income. I have often doubted that the old car gets 17 mpg. I'm not sure how we could check, as the gas gauge doesn't work right (you go around the corner and suddenly the tank is FULL). So, if the online estimate is wrong, then by not going out and back for gas every other week, we're saving even more. We have been revisiting scaling back to one car. We were a one-car family for the first 10 years of our marriage. I was home with the kids, and we homeschooled, so it wasn't much of an issue. I just planned errands for weekends. Now, I volunteer a couple of times per week, and I work one day per week outside the home. And I'm looking at adding more paid work. So, we'll have to wait and see if there's a way that we could get by with just the one car. It would be a savings. The little things really do add up. The first week my husband announced our income change, I went over the budget and figured if I trimmed everywhere, I could save us about 2/3 of the shortfall. Although, I really couldn't imagine taking a 75% reduction as gracefully as you have. Keep blogging about it, as it does inspire others to have a positive outlook, even when things look bleak. I have a store loyalty card that also gives us savings on gas. You can pump up to 30 gallons. So, I fill the car and then fill gas cans until I hit the 30 gallons. We had to purchase a couple new gas cans (got at a yard sale) but they paid for themselves quickly by allowing us to have more of the cheaper gas. Clever lady, you are! I am definitely going to try and max out my reward the next time I have one. I have been thinking about buying another 2 gas cans. I think our primary car could go 3 1/2 weeks to 1 month on a very full tank. And 2 more cans would buy gas for my husband's car for the month. Plus when the rewards were there, we could buy even more at the savings. You have a good system that’s working for you. I’m a bit apprehensive about portable gas cans. When I pick up gas for my mower I get it at the station less than a mile from home so I don’t have it in the car any longer than absolutely necessary. This is what I’d do if I were in your situation, when your husband’s car is low on gas and you have to run errands that will put you near a gas station you could trade vehicles for the day. You could fill his tank and he’d be good to go for several weeks. Thanks for the suggestion. I'll see if that could work for us. We qualified for QFC's reward 4 times last year, mostly due to buying gift cards in the store, when they offer double the points for giftcard purchases. We used the gift cards to give as gifts (Christmas, birthday and end of year teacher gifts), and pay for things we were planning on spending $ for anyways. Also, in November, I find QFC has some good stock-up sales, and that boosted our points as well. I feel the same way about transporting filled gas cans. It makes me a bit nervous. We put the filled cans in well-secured boxes in the trunk, so they can't topple over. For me, too, it's the fumes. I can smell when there have been gas cans in the car. We live in the sticks and the cost of gas here is sometimes more than $1 higher per gallon than it is in the neighboring county. If we are careful hubby can get by with filling up twice a month and we do try to coincide that with trips to town. However since daughters car gets such better gas mileage we now drive it more often. That leaves us filling his car up here on occasion but is still a savings over having to leave the county to buy gas. It sounds like you've found a way to minimize what you are spending, and how often you have to refuel. That is nice to have your daughter's car there. I am so looking forward to getting a car that gets good mpg. The Europeans have us beat on fuel efficient cars. We do what the frugalspinster suggested. My husband usually has cheaper gas in the area works, so we trade cars when a fill up is needed. It's an easy fix if you aren't considering a store loyalty card or there's not a big difference in gas mileage between the two cars. I'll have to see if my husband thinks his car could get me around on my errands. His car has an over-heating problem, then it shuts down until it can cool off (something with the engine block, and the fix has been estimated at $1500). His car may not get me to all my errands. But it works great as a car that just needs to travel a couple of miles at a time. But I'm glad that works for you. Now that's ingenuity! I have to say, that this post makes me feel very grateful for my "light driving" lifestyle. I'm a big fan of ordering things online rather than driving around town to get them. I used to do it more sparingly, but these days, it's just easier - plus most things I can get through Amazon.com with free shipping. Maybe this is just laziness on my part, but it makes my life soooo much easier, it saves me gas money, time and hassle, and very often the prices are cheaper through Amazon than in the stores! Anyhow, if it weren't for my cats, I'd probably only take the car out once or twice a month! I shop online, when I can. But I also like to check things out in person, if I'm not totally sure about something. And sometimes, I'm just impatient, and can't wait the 3-5 days. But I'm really not doing much shopping these days. It's just best for me to stay out of stores. Most of my driving is more along the lines of volunteer work, paid work, or giving people rides. Just curious question.... is Seattle area just too dangerous to walk or ride a bike to the bus stop? I know this is the case where my Niece lives in New Jersey especially with her husband being deaf where the traffic makes it simply too dangerous. I only ask because 1.5 really is not that far but know that really depends on where you live if the walking or riding a bike is even an option. That's a valid question. My husband is disabled, specifically with a mobility disability. He gets around on crutches. In the city, 1.5 miles is not at all too far to walk, for an able bodies person. Sidewalks, well-lit streets, etc. We live in an unincorporated area. Our neighborhood does not have sidewalks, and street lighting is sparse. But my daughters do walk it home, when it's dry and still light out (they take an earlier bus home from the city than my husband does). If my husband were to try to walk to the bus stop, he would be putting himself at risk. Crutches slip easily on wet surfaces. Not to mention that he travels much more slowly than an able-bodied person. He would need to leave the house at 5 AM, and wouldn't return until well after 8 PM, which would be an exhaustingly long day for him. Factor in dark roads, and pedestrians just aren't seen in dim light, and no sidewalks for much of the way, and he would not be capable of jumping out of the way of a vehicle, as an able-bodied person could. And once fall hits, and the days shorten, I'm not comfortable with my daughters walking home from the bus in the dark evenings. The area right around the bus stop is not the safest spot in town. So, for many reasons, we find it important to have that second car.